A departure from leadership is highlighting diversity issues less than a week before the march. Less than a week before the March for Science is set to take place across the country, many scientists are taking to Twitter to express disappointment at the organizing committee’s seeming lack of attention to diversity. On Sunday, Jacquelyn Gill — an Ice Age ecologist and professor at the University of Maine — posted a series of damning tweets lambasting the March for Science’s organizing committee for its lack of attention to minorities, women, and other groups that have traditionally been shut out of science, accusing leadership of being hostile. Despite assurances to the contrary, diversity and inclusion work was increasingly compartmentalized, and decisions made without our input. Several in leadership positions said, in effect, "diversity is a distraction from the real work of the march. We're trying to save science." Those of us working on the diversity team weren't asking for diversity issues to supplant the march's goals, but to be included at all. We fought for weeks to be involved with the M4S Twitter account, and to remove individuals who were openly hostile to diversity issues. But to many scientists and science activists, brushing aside the concerns of community members who haven’t traditionally had a spot at the table is troubling and hypocritical of the march’s intent. Gill isn’t the first to raise the deep problems within the organizing committee of the March for Science, which has struggled with a lack of coherence in mission and issues from the outset regarding representation and organization. In fact, the March for Science has been plagued from the very beginning with first its silence — then its floundering stance — on how to address issues that overlap with the push for science’s recognition as a foundation for knowledge and economic power in America: gender, religion, poverty, economic mobility, ableism, and more. Scientists have clashed on whether the March for Science should incorporate political hot-button issues or simply stand up for continued funding for science. The tweet that March for Science sent out didn’t help pacify critics, instead churning out a slew of new ones that found its outwardly political stance one that was distasteful and politicized a field they felt should be based on fact, not on where a person stood on the political spectrum. The March for Science’s clumsy response was to post this now-deleted tweet. Mika McKinnon, a geophysicist, was originally supportive of March for Science leadership but later abandoned support after being turned off by the organization’s diversity flip-flopping. “For context, I’m Canadian-American,” McKinnon tells Inverse while driving, saying that her experience working with the Stephen Harper government in Canada instilled in her a strong sense (“I have almost PTSD about this, I spaz out immediately”) of “the muzzling of scientists.” She points to changes in the long-form Census in Canada, which prevented grant applications, mucked up numbers that drastically misrepresented the work of scientists, and affected immigration rates to high-tech, scientific positions. To McKinnon, science is a precious, fertile battleground for the hottest political topics that often snuffs out the voices of those who may not have power outright. 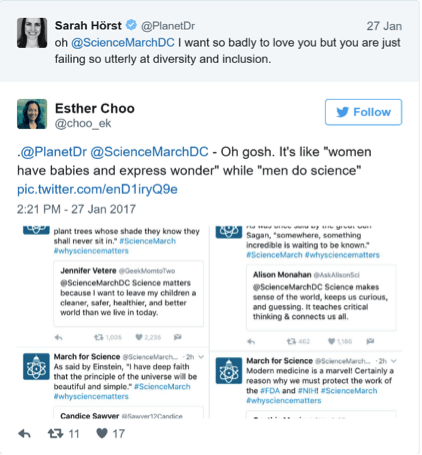 @PlanetDr Has @ScienceMarchDC abandoned the idea of having known sexist & racist harassers present or not? That “target audience” has seen itself flummoxed by the March for Science’s haphazard planning, committing faux pas that have made its non-white scientists angry. Earlier last month, sociologist Zuleyka Zevallos penned a series of essays criticizing the March for Science’s confusing stance on minorities and immigrants. Zevallos points to the fact that the scientific community is heavily represented by immigrants, many of whom were born in countries that fell under January’s Muslim ban instituted by the Trump administration. Zevallos repeatedly points out the fact that the March for Science was inspired by the overwhelming success of the Women’s March the day after Trump’s inauguration and subsequent attack on science, suggesting that its inspiration should have instigated the March for Science to be especially cognizant of diversity in all its forms and to address the fact that non-white, non-male scientists were contributing to science in America. That, say March for Science critics, isn’t the case, pointing to the March’s Twitter feed that heralded exclusively white male scientists as revolutionary and ignored the contributions of other scientists. Which brings us to Sunday’s flow of tweets from Gill, which has garnered replies and retweets. Gill suggests that not only is the internal organization of March for Science fraught with insularity and a lack of openness to other voices, but a troubling view of the future of science that excludes the voices of marginalized scientists. In particular, Gill accuses senior leadership of ignoring the suggestions of women and people of color in not only stopping abusive comments on social media but also not heeding the concerns and thoughts of women, people of color, differently-abled people, and gender queer scientists. Often, work that women (especially WOC) did (much of it assigned!) was ignored until a white man suggested it, or redone. Meanwhile, the climate could be hostile for women, and women of color especially, on M4S team Slack channels. Overall, this had the effect of weakening the March and its goals by alienating those who stand to lose the most in the War on Science. Because #ScienceMarch organizers aside, the M4S spaces on Twitter and Facebook have been hostile and abusive to women, POC, PWD, immigrants. McKinnon says that these recent developments are proof that the March for Science has become “gatekeepers of what science is and who does science,” creating a community of people who are recognized as scientists and others who are not. “Gatekeeping limits diversity,” she says. “Diversity is an objective good (numerous studies show diversity of viewpoints leads to more creative and efficient solutions to problems), so inhibiting diversity is abhorrent to data-driven policy. Inverse has reached out to the March for Science and Gill for comments and will update this post if a response is received.